It would be a good idea to write this down, because I'm definitely not going to be able to spell it twice - Trimerorhachis is an amphibian that looks just like a modern mudpuppy, except that it comes equipped for battle. We think of frogs and salamanders as having soft skin, but this species is covered in bony armor. 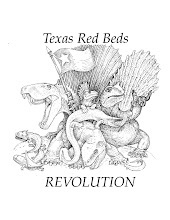 As it turns out, nearly all of the amphibians found in the Texas Red Beds are similarly battle-ready, covered everywhere with armor. As Dr. Bakker puts it, "You could hit them repeatedly with a hammer and not slow them down." Why? What did they need this protection for? And what made modern amphibians get rid of it? Fossils from this species are surprisingly rare at the dig teams' site, though they have found pieces of a skull at the main site. Pretty worthwhile piece of writing, much thanks for the post. It can't work as a matter of fact, that's what I suppose. If you're interested in more general science updates, please visit the Museum's new blog. For about a year, the Museum has been sending a team of paleontologists and volunteers to Seymour, TX, a little town about 2 hours outside of the Dallas/Fort Worth area that happens to be the world's best site to find Dimetrodon - the biggest, baddest, pre-dinosaur predator. Led by famous paleontologist Dr. Bob Bakker, the team uses a "CSI" approach - picking out every bit of fossilized evidence they can find, from teeth to tiny bone fragments - in the quest to discover exactly what creatures died here 290 million years ago - and more importantly, how they lived. While they're in the field, you can follow their exploits here. They'll be posting daily with pictures and information about what they have found and what it all means. You can explore more about the species they are finding and the answers they are looking for at the links below. They would love to answer your questions - so come back, and post often. The team has now returned from Seymour, and though we will be posting relevant updates as they occur, daily discoveries are on hold until they return to the field. Please feel free to explore the links below to learn all about what they've found - and leave us a question or comment to let the team know what you think.